During any given hospital stay, patients spend most, if not all, of their time in bed. That means they are surrounded all day with hospital linens. From their gown to their sheets and blankets patients have more contact with these items than anything else in the hospital. 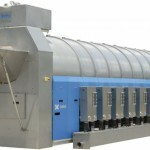 Therefore it makes sense to ensure that they are properly cleaned, dried and transported to avoid cross contamination. Using the proper chemicals, water temperature, and mechanical action are all necessary to properly clean goods but healthcare laundry should go one step further by using barrier machines to ensure that germs from soiled goods are kept away from the clean. 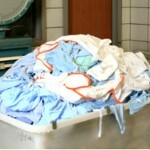 Picture this: A patient’s sheets are stripped off the bed and placed in a bin for contaminated linens. They are then bagged and transported to the hospital laundry where a laundry worker takes them from the bags and places them in the washer. Standard protocol is for the worker to wear gloves to avoid personal contamination. The door is closed, the wash cycle selected and the start button pressed. Of course the worker has more than likely also touched the front or other surfaces of the machine as well. While the gloves protect the worker from germs nothing protects the machine. The germs from the linens have been carried across the rim of the washer during loading, the handle, the cycle select buttons, the stop button or anything else on the machine the worker may have touched. Most facilities would now spray the areas touched with disinfectant in an effort to sanitize the front of the washer. Hopefully, the disinfectant is strong enough, enough was used and all surfaces were sprayed because when the worker returns at the end of the cycle to put the goods in the dryer they have to touch the handle and drag the linens back over the rim to put them in a cart. All this can be avoided and there would be no question of cross contamination by using a barrier washing machine. When it comes to cleaning hospital linen common sense indicates that everything that comes in contact with the goods should be hygienically clean to add another protective layer. What is a barrier machine you ask? It’s a magical washing machine designed for the sole purpose of keeping soiled and clean goods physically separated during the wash phase. 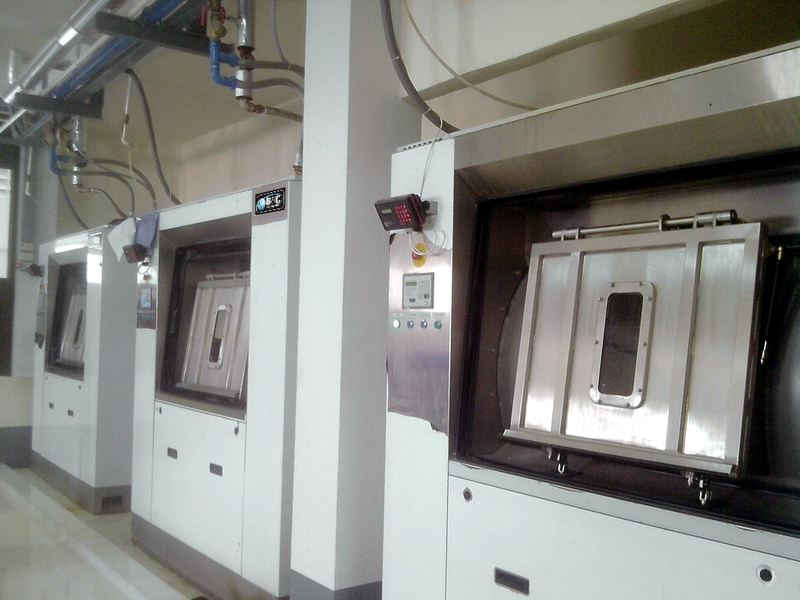 For very large hospital laundries the best type of barrier machine is also know as a tunnel washer or continuous batch washer. These large washers have soiled linens placed in one end of a long tunnel and they are moved through the washer by an Archimedes screw. This screw separates the load into batches. Water and chemicals come from the other end, in the opposite direction of the goods so every time the laundry goes into the next pocket cleaner and cleaner water is used. These machines are so large that the soiled goods are in one end of the room while the cleaned goods are at the opposite end. For smaller laundries, or smaller loads, there are pony barrier washers. These machines are made to be built in a wall with a clean laundry room on one side and soiled linen room on the other. It has two doors, one on the clean side and the other on the dirty side. Only one door can be opened at a time so when a worker is loading dirty laundry on the soiled side, the door cannot be opened on the clean side, allowing germs to contaminate the clean room. 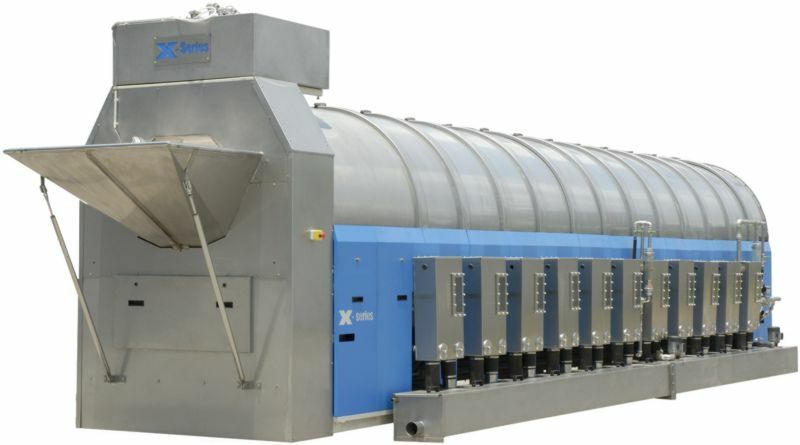 In a best case design, the air pressure in the clean side of the laundry is higher preventing any air from the soil side from reaching the clean side. The laundry is loaded on the dirty side, the door is closed, program selected and start button pressed. Once the cycle is finished running the workers on the clean side of the laundry remove the laundry from the washer. No germs from the soiled laundry have touched this side of the machine. One more thing that would help hospital linens closer to be completely germ free is the use of an Ozone system. 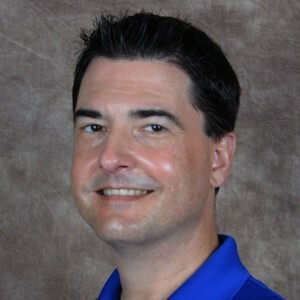 Very soon we’ll add another blog that details more about the sanitizing effects of adding ozone. I can only imagine how important it is to have a great laundry service in hospitals. It is interesting that workers doing the laundry wear gloves, so they don’t cross-contaminate. It seems to me that they care about the well-being of the patient and they only want the best for them. Thanks for the comment, Luke! 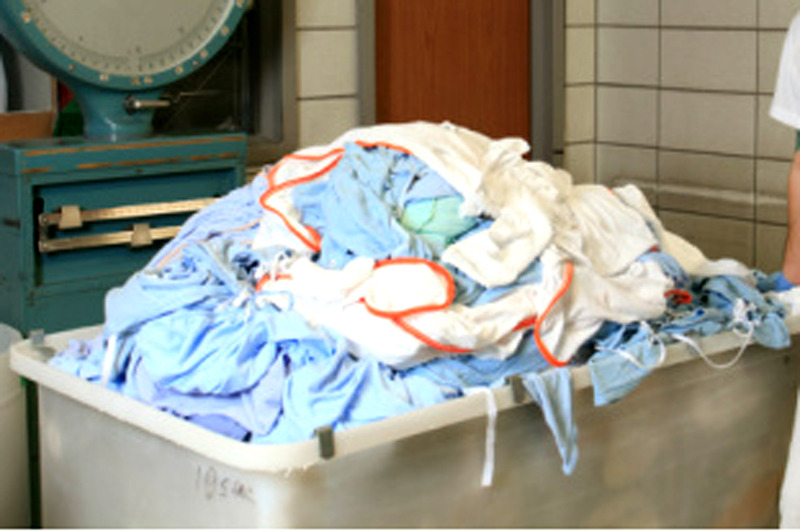 You’re right – laundry processes in a healthcare environment are a critical part of reducing hospital acquired infections. It just takes education – as you say, the hospitals certainly care about the health of the patients in their care. When you bring a cart of laundry in, does it matter if you separated it or do the whole cart at once and separated after. Typically, presorting is best practice because different fabrics require different levels of care. 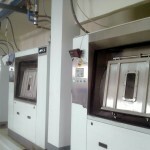 As a practical matter, the machine will perform better if fully loaded with the same fabrics. If you were to mix sheets and towels, the terry will absorb more water and can cause balancing and vibration issues. Differing amounts and types of wash chemicals are needed for different fabric types as well, especially in a healthcare environment where bed linens, towels, scrubs, and more are processed. Another benefit to presorting is separating out severely soiled items for special processing. This alone will save tremendous amounts of time in processing. If heavily soiled items aren’t removed prior to a standard wash, they must be rewashed wasting time, energy, water, labor, and chemicals. Thanks for the comment and I hope I’ve answered your question adequately.